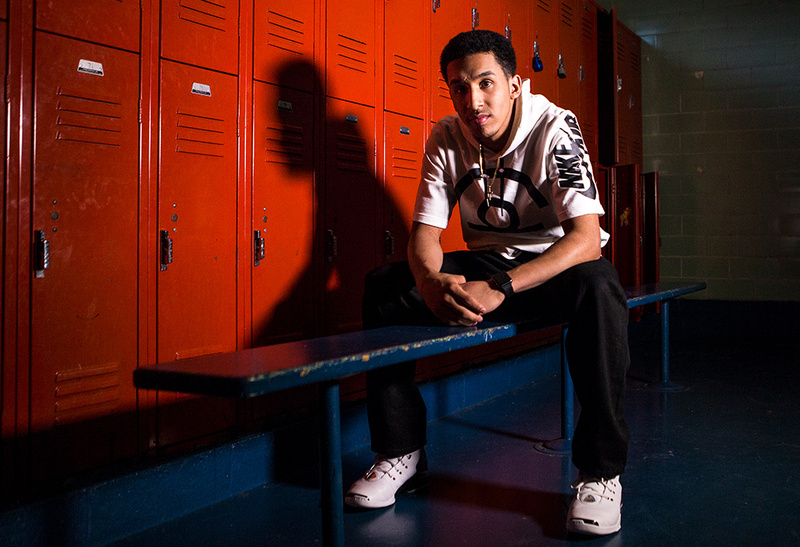 When Tremont Waters was in sixth grade, his hometown of New Haven, Connecticut, was the fourth-most dangerous city in the nation on a per-capita basis, with 34 murders and 893 assaults. His neighborhood of Newhallville once produced “The Gun that Won the West,” the mighty Winchester rifle. But when the factory and its 19,000 jobs left town, the area became Gun-wavin’ New Haven, better known for people carrying firearms than making them. Newhallville butts up against Yale University, and the school’s air of privilege and boundless possibility brings into sharp relief the gap between haves and have-nots here. But what Tremont had was basketball. You may think you’re about to read the same story you’ve read, oh, maybe a thousand times before: Kid from low-income area uses hoops to get a university education, and perhaps a chance at NBA millions. These heart-warming tales underscore the value of college sports as a tool of social uplift for black Americans. And maybe they even renew our faith in the American dream, that anyone can rise from bottom to the top if they work for it. We’ll give you that feel-good story. One of the nation’s top point guards, Waters will play high-level Division 1 hoops next season — his suitors have included Duke, Kentucky and Indiana. For a while, he was headed to Georgetown where he planned to wear the No. 3 of Allen Iverson — the Answer. “My dad was a huge fan, so I just had to be a huge fan,” Waters said, showing off his phone’s screensaver, a photo of him at age 7 in AI’s Hoya jersey. But we’ll also tell you the rest of the story: That players like Iverson and Waters – the first members of their families to go to college – are increasingly rare in college sports, even in the big-money, high-stakes sports of basketball and football. Indeed, most athletic scholarships are going to middle-class kids with college-educated parents, not to kids from poor families who need a scholarship to get anywhere close to a university campus. Simply put, NCAA sports have been gentrified. For March Madness this year, the NCAA is running a public service announcement called “Opportunity,” which includes images of some athletes from disadvantaged areas who will get to go to college by playing basketball. It underscores the notion that a core piece of the NCAA’s mission is providing athletic scholarships and college educations to student-athletes in need. But here’s the stark, myth-busting truth: Fewer than 1 in 5 students playing Division 1 hoops, and 1 in 7 in all Division 1 sports, come from families in which neither parent went to college. And their numbers are declining. Educators call such students “first gens,” or members of the first generation of their family to attend college. It is a closely tracked figure because it’s a key measure of socioeconomic opportunity. First gens are typically from poor and working-class families that have difficulty paying for college without scholarships. For first gen athletes who don’t go onto the pros — the vast majority – an athletic scholarship is their ticket not just to a degree, but also for entry into the middle class. In 2010, the NCAA began asking college athletes whether they are first gens as part of its little-known GOALS Study, which captures the background and experience of those playing sports at all three levels of competition. In 2015, it did another survey of 21,000 athletes. The Undefeated asked the NCAA to break out a portion of the data on first gens to get a fuller understanding of who gets to play college sports. Surprisingly, the data revealed that most Division 1 sports experienced steep drops in first gen students. The falloff was dramatic even in the sports most associated with tales of uplift: In men’s basketball, the sport that used to have the highest percentage of first gens, the number plummeted by a third in just five years. Women’s basketball experienced a similar drop. Football fell by more than 10 percent. The declines happened across most sports and for both men and women – from baseball and softball to soccer and women’s gymnastics. There were a handful of exceptions, with increases in men’s swimming and women’s volleyball, for instance. But they didn’t change the overall trend. And the bottom line – that only 14.2 percent of all Division 1 athletes are first gens – most likely overstates their presence. The NCAA did not survey athletes in 10 smaller sports, several of which can be expensive to play and thus less accessible to families that lack resources: equestrian, fencing, men’s gymnastics, bowling, rifle, rugby, sailing, sand volleyball, skiing and squash. It’s not a perfect apples-to-apples comparison. The 1,124 NCAA member schools comprise less than a third of all four-year institutions in the U.S., noted NCAA chief research scientist Tom Paskus. Given that NCAA schools often have a higher academic profile than non-NCAA schools, we should expect a lower percentage of first gens in the general student population at NCAA institutions, he said. Still, the drop in first gens among college athletes is cause for concern, NCAA president Mark Emmert told me at an event at the Aspen Institute last September. The findings may require some getting used to, from journalists who have perpetuated the storyline of basketball as a tool of social uplift to anti-trust lawyers arguing over the NCAA’s amateurism model to basketball coaches who fancy themselves benevolent agents of opportunity. “I’m a little taken aback that that is what the [data] show,” said Jim Haney, executive director of the National Association of Basketball Coaches. The percentage of first-generation DI basketball players fell dramatically from 2010 to 2015. But the numbers don’t lie. There were about 400 fewer first gens in Division 1 men’s hoops in 2015 than in 2010, and about 300 fewer in women’s hoops. That’s the equivalent of 50 teams, enough to fill much of each NCAA tournament bracket. Across all Division 1 sports, the first gen population is down by nearly 2,000 people. The trend is “scary,” with implications that transcend sports, said Kevin Washington, the 62-year-old CEO of the YMCA of the USA. He was once a first gen himself, playing basketball at Temple University after growing up in a working-class home in Philadelphia. Now, he could be a public service announcement for what first gens can become, leading an organization that serves 2 million kids. Playing college ball provided the foundation for his success, he said. The Y is in the business of developing kids and encouraging healthy living, not grooming the next generation of athlete-entertainers. But dreams count, too. “Don’t punish these kids,” he said. The NCAA says it’s not punishing anyone and defends the message of the public service announcement it is running during the tournament. Rising academic standards at the NCAA and its member colleges. The increasing importance and cost of early training to being recruited for Division 1 sports. A growing black middle class that can afford the early training and educational advantages that open the door to college sports opportunities. The more elite the university’s academic and athletic reputation, the more these dynamics come into play. By contrast, the number of first gens at historically black colleges and universities (HBCUs) is increasing, with the percentage now more than twice the rate of other schools. Coppin State University represents a beacon of hope amid the rundown rowhomes of West Baltimore, where the riots erupted in response to the death of Freddie Gray. With its trimmed grass and shiny facilities, the campus stands out like a jewel, and on a recent cloudless winter day, it really sparkled. Michael Grant, the men’s basketball coach, and D’Wayne Robinson, the athletic department’s director of compliance and academics, met with me in a conference room overlooking the basketball facility to talk about how the NCAA and its major conferences benefit from the efforts of HBCUs to preserve the social uplift ethos. Robinson stops there. He and Grant are reluctant to crow too much. They appreciate the important role of HBCUs in African-American uplift. But Grant acknowledges that no more than one-quarter of his players are first gens. That would be the NCAA’s Academic Progress Rate, a policy that some believe limits opportunities for educationally disadvantaged athletes. Since 2005, the NCAA has held institutions accountable for the academic progress of athletes by measuring the eligibility and retention of each athlete. Recruit one player who lacks ability or interest in classroom matters? That can hurt a program. But recruit a bunch, and draconian penalties await. Teams have been banned from the NCAA tournament for low scores, most notably the UConn men in 2013, two years after they won a national championship. As a result, Grant said, he only recruits players with 2.5 GPAs or higher. Waters is a B-plus student. He’s smart, disciplined and sufficiently prepared to get into some of the nation’s most academically rigorous colleges. 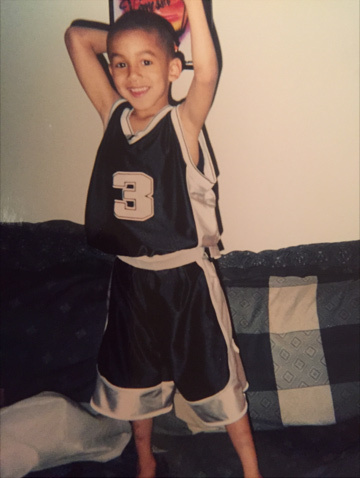 He plans to major in finance, and is confident that he’ll be able to balance books and ball, which is a commitment of more than 30 hours a week. Plus, the physical and stylistic similarities between him and Iverson are striking – like AI, he’s a 5-foot-11, 165-pound jitterbug with a ridiculous handle and court sense. That’s why, besides Georgetown, Duke, Kentucky and Indiana, Waters had offers from Kansas, UConn, and, yes, Yale. Because Yale knew this New Haven kid could get in. Even so, Waters’ experience shows how much has to fall exactly right for even one kid from Newhallville to make it to a place like Georgetown. In sixth grade, the year when his hometown was among the nation’s most dangerous, his parents, Ed and Vanessa Waters, decided to move him from the local public schools to a private school, Greens Farms Academy, 45 minutes by train to the west, in Fairfield County. 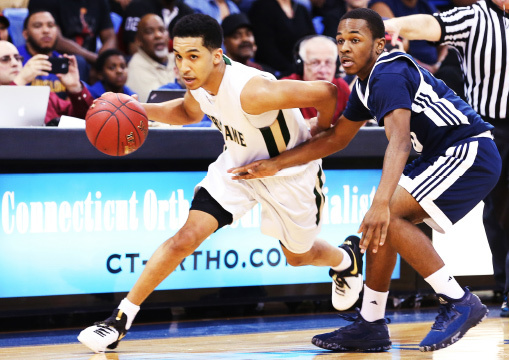 Tremont Waters, one of the top high school point guards in the nation, sits inside of the locker room of the Farnam Center in New Haven, Connecticut, where he first started to play organized basketball. Photo by Anthony Geathers for The Undefeated. Ed Waters is an HVAC tech. Vanessa Waters is a geriatric nurse and, like her husband, never went to college. They really couldn’t afford Greens Farms Academy, even with the school covering most of the $33,000 annual tuition at the encouragement of its basketball coach. At the same time, the Waters couldn’t afford to pass up the chance to remove their son from a setting where he was already being pressured to join a gang. The Greens Farms campus is set on 42 acres of a former Vanderbilt estate, surrounded by salt marsh, woodland and the Long Island Sound. Teachers at the academy, a top independent school in Connecticut, quickly realized that Tremont, despite being an honors student at his New Haven magnet, hadn’t learned enough. The school allowed him to repeat sixth grade, and barraged him with tutors. Few of his classmates were students of color, but he rolled with it and aligned his expectations with those of his teammates. “From the day I stepped on the court, I knew I would be the oddball if I didn’t work hard in school,” Waters said. By his freshman year of high school, he was pulling straight A’s at another Connecticut prep school, South Kent, Ed Waters said. Greens Farms would have been fine to stay at, as more than 100 alumni since 2000 have gone on to play at the NCAA level, including 10 in men’s basketball since 2013 (Duke’s Sean Obi among them). But South Kent offered an even better on-ramp to hoop heaven. In the past 10 years, the boarding school has sent 60 alumni to Division 1 programs and eight players to the NBA, including Boston Celtics All-Star Isaiah Thomas. 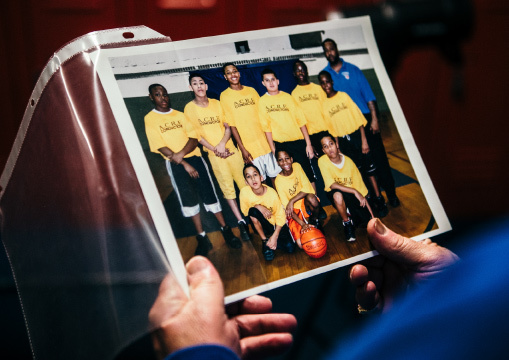 From Biddy Basketball to the state tournament: Frank Redente, operations director at New Haven’s Farnam Center, holds a photo of a youth team featuring Tremont Waters (on the left in the bottom row). Photo by Anthony Geathers for The Undefeated. RightBottom, Waters, in his last game as a high school player, dribbles past an opponent in the Southern Connecticut Conference championship. His team lost 70-62. Photo by Mike Ross for The Undefeated. Just as wealth builds wealth, advantage builds advantage. Repeating sixth grade at the Greens Farms Academy while playing up with the high school team each of those years means that Waters is now in his eighth year of high school ball. You read that right: eight years of high school hoops. He’s finishing out at Notre Dame High School, back home in New Haven, where he can spend more time with his parents before heading to college. If he had landed at Georgetown like he originally planned, Waters would have joined a Hoya roster wholly unlike those that created a national profile for the program in the 1980s and ’90s. Long gone are the Hoya Destroyas, the hard-edged band of working-class kids that provided John Thompson Jr. with his first and only NCAA championship. Exemplifying the ethos of that team was Michael Graham, an elbow-throwing forward who grew up poor and hungry in Southeast Washington, D.C. He told me the only reason he went to school was to eat, and that he robbed people for dinner money. “I never owned a pair of real shoes,” he said. “I wore cloth bedroom slippers, even in the snow.” He took up basketball in eighth grade mainly because, at 6-foot-7, he was the tallest kid in the school. Iverson came along a decade later. He skipped nearly a third of his school days one year, got locked up for an overblown incident in a bowling alley, earned only a high school equivalency degree – and still got into Georgetown, enrolling after classes started, just in time for the ’94 season. Today’s Georgetown roster, by contrast, is dominated by recruits from private schools. From a review of their online biographies, most have a college-educated parent who went on to be a professional – a couple of them even pro athletes. Alonzo Mourning’s son, Trey, suits up for Georgetown, as does Gheorghe Muresan’s son, George. Since becoming Georgetown coach in 2004, Big John Thompson’s son, John Thompson III, has recruited other children of the jockocracy – not just Mourning and Muresan but the sons of Doc Rivers (Jeremiah), Reggie Williams (Riyan), and Patrick Ewing (Patrick Jr.), among others. In September, he offered a scholarship to Shaquille O’Neal’s kid, Shareef, a top 20 prospect in the class of 2018. Still, the backgrounds of the players being pursued concern Graham, who argues the Hoyas would be better with more kids who grew up with less. While the Golden State Warriors have done just fine with the sons of NBA pros (Stephen Curry, Klay Thompson), that’s not been the case at Georgetown. For the second straight year, the Hoyas had a losing record and missed the NCAA tournament. Today’s Hoyas are not devoid of players from modest backgrounds. Team captain Bradley Hayes lost his dad, an auto mechanic, at age 46. His mom worked multiple jobs. He graduated from a public high school in Jacksonville, Florida. But he’s an anomaly. Across Division 1 sports, first gens, regardless of race, are now less common than they are in DIII, an extraordinary development because in DIII there are no athletic scholarships – no aid to help pay for college. And while race often matters in shaping access to elite institutions in American life, the data suggests it’s less of a factor in NCAA sports than that of socioeconomic status. For instance, across all divisions, only 3 in 10 black athletes come from homes in which neither parent attended college. In Division 1 hoops, just 25 percent of African-American men and 22 percent of African-American women are first gens, according to the NCAA. “We’re seeing a generation of kids from [black] families whose parents, going back to the early ’90s, got college degrees,” said Paul Hewitt, former Georgia Tech and George Mason coach. Now an NBA scout, Hewitt points to the growth of the black middle class as influencing the shift in roster demographics. Black migration to the suburbs increased by 14 percent from 1990 to 2010, according to the Brookings Institution. While the number of middle- and upper-income black households still trails the figures for whites and Hispanics, the growth over the last generation has been dramatic — nearly 50 percent, according to a 2015 Pew Charitable Trusts report. These middle-class families are better positioned to provide their children with access to good schools and private training, enhancing their value to recruiters. Indeed, Coppin State’s Grant finds players through the same pipeline as John Thompson III found Waters: the elite club teams that aggregate and groom talent as early as grade school so that private high schools and colleges can scout them at summer tournaments. In this fee-based system, the odds are stacked in favor of the kid from the family with the resources to travel, or the precocious talent like Waters who gets recognized and subsidized because he can help a club gain the attention of athletic apparel company sponsors. An invitation from a sponsored elite team on the summer circuit and a scholarship to a Washington Catholic Athletic Conference school, both of which can serve as fast tracks to Division 1 hoops. Another effect of this manic chase for the athletic scholarship are kids who, year-round, play only basketball. 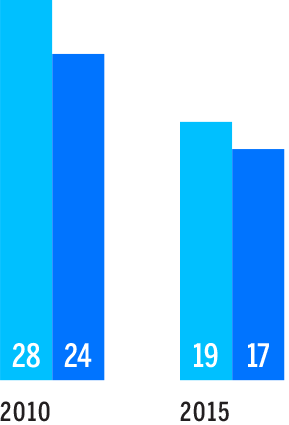 The NCAA GOALS survey shows that 49 percent of men in Division 1 basketball, and 55 percent of women, specialized in basketball by age 12. Emmert said he laments the winnowing that takes place before kids grow into their bodies and interests, especially given research showing the health and performance benefits of multisport play. “In order to be competitive [as a recruit] in that environment, you [need] access to elite training and that can block out some people,” he said. Former college athletes are often the savviest at working the system. Two years ago, Waters and his father attended a public high school game in New Haven. He was just a sophomore and it was still early in the college recruiting process. But that’s when the reality set in on how thoroughly his future already had been separated from that of his peers in New Haven. Ed Waters surveyed the crowd at the gym and started calculating how much talent, hoop and human, had been left behind. Ed Waters didn’t know how many of them were still in school, or had developed interests in other activities. He just knew the scene validated the family’s decision to move their son out of New Haven public schools to private schools elsewhere in state. The success of the Waters family supports the long-held NCAA position that prospective college athletes are capable of raising their game academically. But it also illustrates how much family dislocation can be required. And it raises questions about whether sixth-graders who couldn’t snag a $33,000 prep school scholarship — or manage a 45-minute commute by train — can find their way to a college scholarship. John Thompson Jr. posed a version of that same question a quarter-century ago. He was uncomfortable denying educational opportunity to scores of low-income students for the sake of improved college graduation rates among athletes. In 1986, the NCAA introduced Prop 48, which required a minimum 700 SAT score (17 ACT), and 2.0 high school GPA in 11 core classes, to practice and compete as freshmen. Most players affected by the new standard were black: Within one year, the number of African-American freshmen recruited into all Division 1 sports fell from 3,724 to 3,041. Then in 1989, NCAA members approved a rule denying athletic scholarship aid to any freshman who didn’t meet the standards. In protest, Thompson walked off the court before a game and drove around town. At one point, he passed a convenience store. “If these kids today don’t get that opportunity [at an education], who are they going to look to? Those people lingering at [outside the store]?” he told The Washington Post. The rule was rescinded. But NCAA members picked up the battle again in 1996 with Prop 16, introducing a sliding scale for GPA vs. standardized test scores and tougher requirements. Again, the proportion of African-American freshmen fell. With each change, however, graduation rates for black athletes improved. And those rates became the common measure of success. Gradually, the rebellion lost steam, undercut further by academic fraud involving athletes at high-profile programs such as Tennessee, Minnesota, Florida State and North Carolina. The advocates for tighter standards had won. Now, the bar is being lifted further. This school year, the NCAA raised the minimum high school GPA for athletes to 2.3 in 16 core (college prep) courses, 10 of which must be completed by the start of the player’s senior year. The latter requirement prevents sometimes dubious “credit recovery” efforts near the end of high school that have been used to rehabilitate the transcripts of prospects. “No more miracles,” said Nick Myles, athletic director at St. Frances Academy in Baltimore, a school of 200 that sent five players to Division 1 hoop programs last year. The concern of Myles and others is that the rule discriminates against late bloomers, especially those at large public schools with few guidance counselors to help track the academic progress of athletes. Emmert said the NCAA tried to limit the impact on disadvantaged students. When the new rule was being drawn up, it included a minimum SAT score. The NCAA backed off after Hewitt and other black coaches objected, and its research department showed that 43.5 percent of men’s basketball players would have been affected. “We were deeply concerned about that,” Emmert said. The rule ultimately adopted also created a backdoor for schools to make room for athletes who didn’t meet the 2.3 GPA standard: the “academic redshirt.” Recruits who fail to pass 10 core courses in their first two years of high school can still receive scholarship aid as long as they earn a 2.0 GPA – they just can’t compete as freshmen. So far, that option has not been attractive to basketball coaches. According to the NCAA, only 17 athletes across all of Division 1 men’s basketball were certified as academic redshirts this year. Hewitt said coaches are under pressure to win immediately and are reluctant to offer a scholarship to a player who can’t contribute and might declare for the NBA draft after that one year. Pressure to recruit athletes who are likeliest to graduate will ramp up further in 2019. That’s when the NCAA introduces, for the first time, financial rewards for athletic departments with the best academic records. Millions will be distributed to programs that retain athletes, graduate at least 90 percent of them, or whose all-sport graduation rate is at least 13 points higher than its overall student body. Haney, the basketball coaches association executive director, likes where NCAA policies are headed. “Every time standards are increased and information is communicated effectively to prospective student-athletes, they take the challenge,” he said. Still, it’s clear the neighborhood of Division 1 sports – an important one in the African-American experience – is gentrifying. Drawn to the scholarships and prestige of Division 1, families with advantages are moving in. What’s unclear, however, is how much room will be left for kids who are not born into advantages. Even for those special few who are identified early and get help, the demands on their families can be immense. Ed Waters said the stress and cost of extracting his son from the local school and moving him into Greens Farms compromised his health. His weight ballooned to 400 pounds. Doctors diagnosed him with high blood pressure, diabetes, a stroke and sleep apnea. His work suffered, and the family moved in with Tremont’s grandmother. Ed Waters’ heart now pumps at 18 percent capacity. He’s 46, but looks a decade older. He feels like a man going down, as his son is going up. “I HOPE AND PRAY THAT THIS BUILDING WILL PROVIDE COUNTLESS OPPORTUNITIES FOR FUTURE GENERATIONS. JUST AS MY PARENTS, GEORGETOWN, AND SO MANY OTHERS PROVIDED FOR ME.” – JOHN R. THOMPSON JR. But the school’s sports information director, Mex Carey, said Thompson didn’t want to talk about the trend away from first gens. “Issues like this, he’s moved on from,” Carey said. Thompson III was not available. On my way out of the center, a local teenager on a field trip asked a classmate why there were no visible tributes to Iverson, his favorite Hoya. But just as Waters, the point guard inspired by Iverson, is moving on, so are Georgetown and the rest of major college sports. More and more, it appears, the Answer to athletic success doesn’t involve first gens. Tom Farrey is a reporter with ESPN's Enterprise Unit and regular contributor to Outside the Lines. He also serves as executive director of the Aspen Institute's Sports & Society Program.